In honor of Doctor Who's triumphant return this Saturday, it is my absolute joy to introduce you to the concept of trock. What is trock, you ask? Oh, you are in for a treat. Trock is a subset of music devoted entirely to Doctor Who. Trock (literally Time Lord rock) is made entirely by very creative and musical fans of our dear Doctor. Most importantly, the songs are awesome. David Tennant even called it "proper music" in an interview, so you know it has the official Who Seal of Approval! It's proper music! Check out some awesome Doctor Who inspired songs to rock out to while you get ready for "Let's Kill Hitler!" on Saturday! Trock was born from another inspired fandom musical style, called wrock. Wrock, or wizard rock, is music based on the wonderful Harry Potter novels and films. With band names like The Whomping Willows and Harry and the Potters, they caught on like wildfire in the Harry Potter community where they're reguarded as actual rock stars. Their concerts are epic, their crowds full of screaming fans... Doctor Who fans had to get in on this. And thus, trock was born. One of the best known (and most awesome) trock bands is Chameleon Circuit. Made up of Whovian fanboys of the highest calibur (and youtube stars in their own right), they introduced the very concept of trock to a willing internet. Their songs are well crafted love letters to one of the best sci-fi shows ever. Taking on the subject of companions, Daleks, the Doctor's lamentable non-ginger state and the end of the universe as we know it, they have perfected their geeky art. They are my absolute favorite trock band. It's time to rock out with your fez out! The epic "An Awful Lot Of Running" by Chameleon Circuit. Buy their album at DFTBA Records! You can all thank me later for getting these stuck in your heads. You're welcome! Now, who is ready to go kill Hitler?! 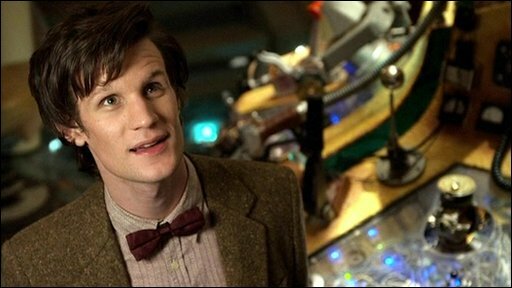 Doctor Who returns this Saturday, the 27th! Check local listings for times, you do not want to miss this one!